Rosary Bracelets There are 55 products. 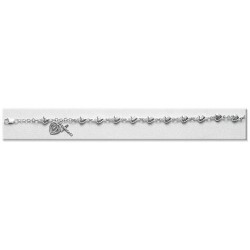 Sterling Silver Sacred Heart Rosary Bracelet - Boxed Traditional Rosary Bracelet in Fine Sterling Silver. 4mm Sterling Silver Round Rosary Bracelet Boxed 4 mm Traditional Rosary Bracelet in Fine Sterling Silver. 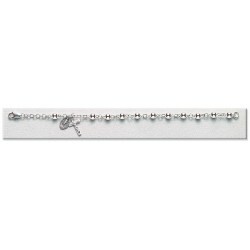 5mm Sterling Silver Rosary Bracelet Boxed 5 mm Traditional Rosary Bracelet in Fine Sterling Silver. 5mm Sterling Rosary Bracelet - Boxed Traditional Rosary Bracelet in Fine Sterling Silver. 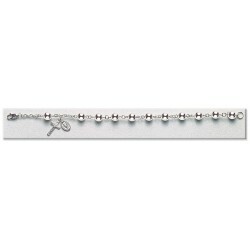 7mm Sterling Rosary Bracelet Boxed 7 mm Traditional Rosary Bracelet in Fine Sterling Silver. Sterling Acorn Cap Rosary Bracelet Boxed Acorn Cap Traditional Rosary Bracelet in Fine Sterling Silver. Sterling Twisted Oval Corrugated Rosary Bracelet Boxed Oval Traditional Rosary Bracelet in Fine Sterling Silver. 6mm Sterling Silver Round Light Frosted Rosary Bracelet - Boxed. 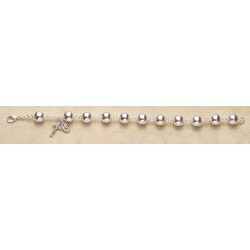 Traditional Rosary Bracelet in Fine Sterling Silver. Sterling Silver Miraculous I.D. Bracelet - Boxed. 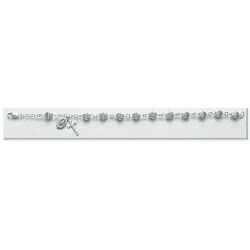 Traditional Rosary Bracelet in Fine Sterling Silver. 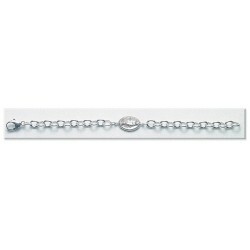 7mm Frosted Swirl Sterling Bracelet Boxed Swirl 7mm Traditional Rosary Bracelet in Fine Sterling Silver. 4mm Swarovski Crystallite Cube Rosary Bracelet Boxed 4 mm Chrysolite Swarovski Cube Traditional Rosary Bracelet in Fine Sterling Silver. 4mm Swarovski Aqua Cube Rosary Bracelet Boxed 4 mm Aqua Swarovski Cube Traditional Rosary Bracelet in Fine Sterling Silver.